A late C14 cruciform church, incorporating earlier work that has not been evaluated. There are good C17 fittings. Poynings lies on the road parallel to the Downs and under the Devil’s Dyke. Despite its proximity to Brighton and Hove, the village is unspoiled, with glorious views of the Downs. A church is mentioned in Domesday Book (12, 30) but the present one contains nothing definite of this date. Though rare in Sussex in appearing entirely later C14 and even rarer on account of the information about its construction that survives, some walling may be earlier. Thus, the east wall of the south transept is built of rougher flint and without a plinth, as Petit noticed in 1849 (see 5). What appears to be part of an opening high up is from its position unlikely to have been a lancet, as has been suggested (VCH 7 p211). It is more likely to be related to the outline of a pointed arch visible on the wall inside. Foundations to the east, in line with the arch, were found in the C19 (4 p236), but it is not clear if they belonged to a transept chapel of a cruciform church, a south chapel or, least likely, a differently aligned chancel. The outline can be little earlier than 1200, but the foundations were barely 2ft thick, which might suggest a considerably earlier date. Excavation is needed here and west of the transept to find out more. In the meantime in view of the amount of render on the walls and much vegetation, not even a provisional judgment is possible. However, there is enough to suggest that other walls, especially the south nave, would also repay close examination. 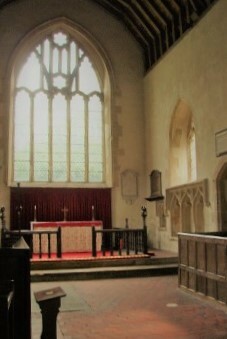 The present aisleless, cruciform church has a short nave and a chancel as high as the other three limbs. Bequests by Sir Michael de Poynings in 1368 and his wife Joan the following year (SRS 43 p331) ‘pour faire une nouvele eglise a Ponynges’ give a date. 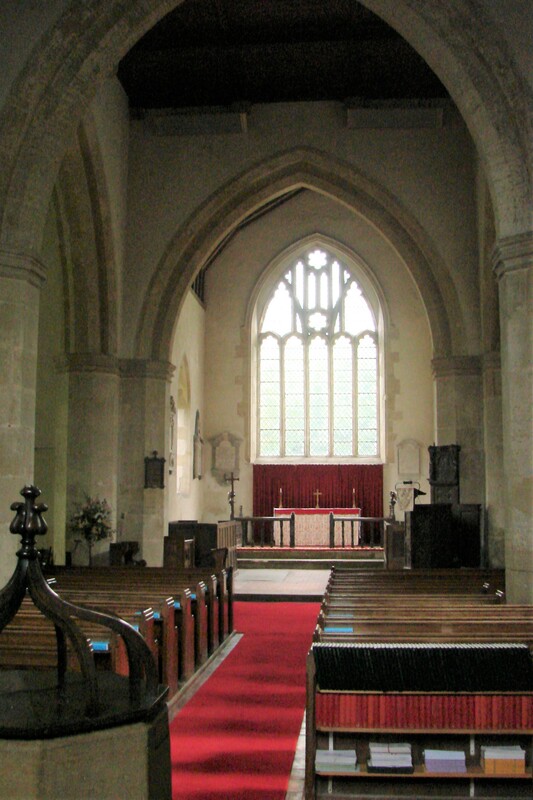 The transepts would have housed chantries (that to the south has been linked to the Poynings family (Horsfield I p176)), though in neither is there any sign of a piscina. The panelled tracery and moulded doorways are entirely up to date, with close similarities between Poynings and contemporary tracery at Edburton and West Tarring. Though the tracery of the five-light east window here is incomplete, it has like that at Tarring encircled sexfoils above and below the panelling in the centre. It can hardly be a coincidence that in 1368 the two shared a parson, John de Worle (4 p41). Other windows are smaller, though the west and north transept north windows have three lights. The crossing and the tower dominate the interior and exterior. The crossing arches have massive semi-octagonal responds and steeply pointed, double-chamfered heads, whilst the tower has tiny trefoiled openings and battlements. There are no apparent pre-Reformation alterations and known later repairs start with the mostly renewed west door, dated 1608. The roofs were repaired soon after, for a dismantled tiebeam dated 1625 is in the south transept. It is likely that at least the south transept and chancel were completely re-roofed, for the Sharpe Collection drawing (1802) shows earlier, steeper roof-lines on the tower. 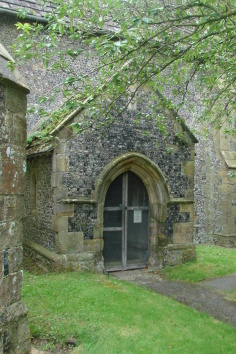 In the early C18 the north porch was rebuilt (2 p112) in finely knapped flint, with earlier arms of Poynings reset in the gable. The outer arch with continuous mouldings is likely to be C14. The then rector removed the tracery above the outer lights of the east window in the 1820s (Horsfield ibid), to unhappy effect. The south transept was cut off until 1842 (Lower II p107) and the Sharpe drawing shows its south window blocked. In 1843 a C17 window with intersecting tracery, concave mouldings and mullions with moulded abaci from Chichester cathedral was inserted (4 p39). 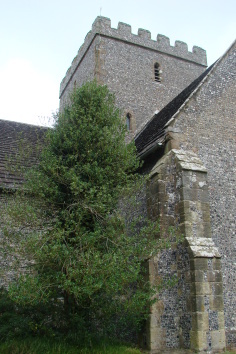 In 1849 the tower and porch suffered lightning damage (B 7 p439). This led to repairs, which are not documented. Thereafter, a succession of restorations by different architects has left the church miraculously unspoiled, with whitened walls and most mediaeval and C17 fittings (see below) intact. In 1876 E Christian restored the chancel (ICBS), replacing the roof but without making good the east window. The south transept was done in 1876 and in 1882 L W Ridge restored the north one (CDK 1882 pt 2 p165). Christian probably did the work to the transept in 1876 and he returned in 1886 to report that the tower was unsafe and some of the nave was bulging (ICBS). He did further repairs, including a new nave roof, which were complete by 1888 (ICBS) and cost only £387 (CDK 1888 pt 2 p143). Further work on the interior and tower by him was completed in 1890 (BN 61 p71) and in 1897 Clayton and Black repaired the south side of the tower (Arch J 6 p281) – wrongly read as ‘Clayton and Monk of Brighton’ (BN 73 p671). Though at that time more work was said to be needed, nothing is recorded until W E Godfrey repaired the south transept window in 1963 (ICBS). 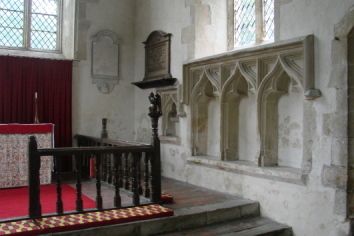 Altar rails: Early C17 with thick turned balusters, surrounding the altar on three sides. This appears not to be the original arrangement, for Nibbs shows them stretching across the chancel. The modern angels on the corner posts are a memorial to a casualty of World War II by W Court. Box: (By organ) Originally a thurible for storing incense and placed on a fluted pillar which alone survives. It was used as a poor-box, it is foreign and the top was dated 1760, with carved figures. Font: Late C14 with eight straight sides, each bearing a trefoiled ogee head. Font cover: Early C17 with an open curling top. Glass: (East window of north transept and others) Early C15 fragments, including an Annunciation in yellow and silver. 2. (North of the altar) Indent of two figures under a canopy. Though dated by Hammond to the 1440s (3 p87), Bertram suggests that it commemorates Sir Michael de Poynings, in which case it would date from c1368 (1 p87). 3. (South transept) Late C14 armoured figure, though the slab is broken. It has been identified as the indent of the effigy of Richard de Poynings, who died in Spain in 1387 (ibid). 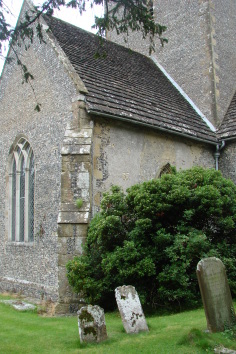 It was formerly in the chancel and is now placed on a low and plain stone base. 4. (South of the altar) Large early C16 stone with indents of a man and wife with scrolls and a representation of the Trinity or Virgin and child above. It resembles the Shelley brass at Clapham (1526) and may be from the same workshop (3 p88). Paintings: (South nave wall) Fragments of C18 biblical texts, including the Ten Commandments. Remnants of mediaeval paintings have been discerned beneath these (Parsons and Milner-Gulland pp108-09). 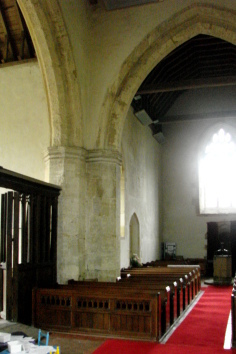 Pews: Early C17, facing into the chancel. Pulpit: Early C17 and roughly carved. It retains its back, but not the sounding board. Screen: (Across south transept) Late C14, divided into six openings each side of a centre opening. As the transept was blocked off until 1842, it must have been moved and may have been the lower part of a roodscreen. Sedilia: Late C14. Triple with cusped ogee-heads, under a single square hoodmould. The adjacent piscina is similar and part of the same grouping.